Here is a link to The Langar Hall post about how to take action on this disgusting matter. Sign A Sikh Coalition Petition here: Harris County Sheriff-Elect Adrian Garcia is visiting the Sikh Center of Houston on Sunday, December 14, 2008. He will be the new Sheriff for Harris County next year. This petition will be directly handed over to him, so please help us gain as many signatures as possible. I have signed it. Sisters and Brothers, please do this today. As I write, it is 11 December and this will be given to the new sheriff this Sunday. I just got an email from the blogmaster at this site. They have put in a link to report instances of brutality. So if you or someone you know has experienced police brutality because you're a Sikh, please go there and report it! I am also to list it in the links in our right hand column. Great work guys! 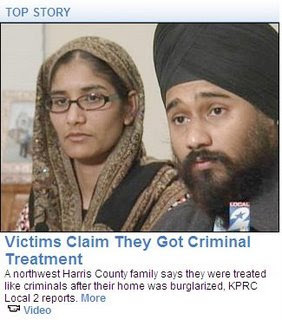 This site is used to document all cases of police brutality towards the Sikhs--anywhere in the world. Take a moment to view each case and TAKE ACTION. If you are ever subjected to racial profiling and violence from the police please take photos, videos, cell phones and document it!! We should not have to live in fear from people we have given authority to protect us. It was Wednesday night November 26th 2008, a day before Thanksgiving when we called the police to report a burglary that took place at our house. Only to be harassed by the very police we called in. This has got to stop! We can't take it anymore. The misbehavior by Harris County police officers towards my family when only hours before our own home was burglarized in Houston is appalling. The officers' behavior sent a loud message to Sikhs and Muslims that we are second class citizens. At the beginning of the Thanksgiving weekend, we came home to find a window broken and master bedroom ransacked. When we called 911 to report the crime, Harris County Sheriff's police officers were dispatched to investigate. But instead of pursuing the thieves, the police officers began grilling us. Officers ordered my sister Ms. Kawaljeet Kaur to hand over her kirpan -- a religious article mandated by the Sikh faith -- which she wore over her shoulder. Ms. Kaur offered to leave the room if her kirpan made the officers uncomfortable, but to no avail. Instead, she, along with me, my mother and cousin, were handcuffed and led into the street. Officers verbally abused us as they searched. An officer applied pressure to my sister's back as she sat on the ground. One officer asked us whether we had "heard about the bombings in Bombay" while another told them that he "knew about Muslims". Why were these comments made by the police?? Hours later, we were released without being arrested or charged. "How can the police stop us from practicing our religion in our own home?" asked Ms. Kaur. "We called the police to help us. Instead, they humiliated and harassed us. They handcuffed my 60-year-old mother in front of my 8-year-old niece. They think they can get away with it because we look different." 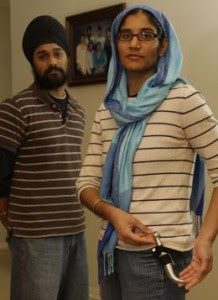 "What happened at the Tagore home was shameful," said Amardeep Singh, Executive Director of the Sikh Coalition. "Through a combination of violence, racial prejudice and intimidation, the Harris County police turned innocent victims into perpetrators." We ask the Harris County to terminate four police officers involved in the incident and issue a formal apology to us while ensuring proper training is provided to all police personnel.